Jobu tells you what he thinks the Giants should do with free agent-to-be runningback Brandon Jacobs. On Wednesday, we discussed the likelihood of a Manning to Manningham reunion at MetLife Stadium come September. I was less than optimistic, and you can check that out here, but today we have a new target in the crosshairs. 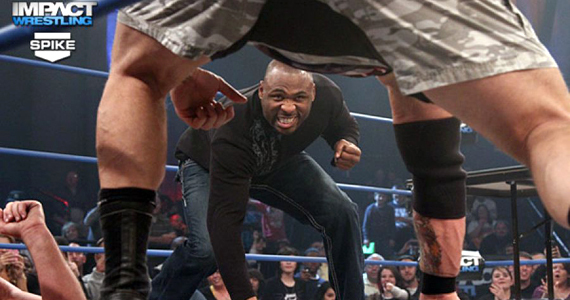 Today we focus on free agent runningback, Brandon Jacobs. Has he done enough in his seven year Giants career for them to fork up a significant amount of money to keep him around? The answer just might surprise you. First of all, there’s a difference between Jacobs and Manningham. 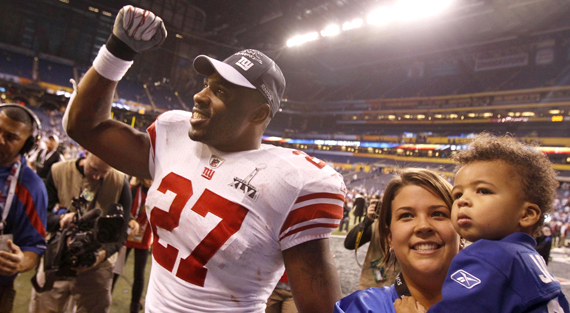 Where there is nothing really special about Mario, Brandon Jacobs is unlike any other running back in the league. The speed he manages to build up on his 6’4″, 264 lb frame almost seems like it shouldn’t be physically possible. He’s bigger than most linebackers, and even some defensive ends, but it pretty much takes a defensive back to chase him down when he gets in the open field. When the defensive backs do catch up to him, he laughs and uses pectoral flexes to send them bouncing off his massive body and into the stands (I’ve seen it!). Ok, so maybe that’s not exactly what I saw, but the point is Jacobs is a beast, and players like him don’t come around to often. Another difference between Jacobs and Manningham is that I’ve never heard Jacobs make any strong statements about possibly leaving the team. Of all the stupid things he has done and said, they’ve never involved getting a big payday or leaving for greener pastures. In fact, prior to last season, The Jake even restructured his contract, taking a lesser base pay, so that the Giants could afford to bring back their other runningback, Ahmad Bradshaw. That’s about as selfless a gesture as you’ll ever see a professional athlete make, and it allowed the Giants to win their second Super Bowl (and Brandon’s too) in the last four years, which i am willing to bet was the goal when he made the decision. So we’ve established that Brandon is a freakish athlete with an unmatched size/speed/agility combination at his position, and a team first guy who truly only wants to win, but is that enough for the Giants to fork over the cash? To make that decision, we have some factors to examine. As I said before, Jacobs’ Giants career has spanned seven seasons. Considering the average NFL career lasts somewhere around four years, you can probably see why I am making a big deal about this number. Jacobs has surpassed the average NFL career by three seasons. He’s also turning 30 this July. The general belief around the NFL (and it’s backed up by hundreds, if not thousands of examples) is that NFL runningbacks tend to hit a wall at 30. At the very least, their performance dips significantly. Of the top ten leading rushers in the NFL this year, only Willis McGehee was over that threshold, and he didn’t turn 30 until late October. Jacobs performance during his age 29 season didn’t exactly inspire a ton of confidence in his ability to outrun age either. The big guy missed some time with injury (as he has in the past with his knee), and only carried the ball 152 times in the fourteen games he managed to play. His 571 yards were his lowest since 2006-07, and his 3.8 yards per carry were his the second lowest of his career (not counting the 99 yards he rushed for on 38 carries his rookie year). So it seems we have reached a crossroads with this situation. Do we reward the ultimate team player at the risk of relying on a slightly aging runningback with an injury history? Unfortunately, I don’t think the Giants can afford to pay top dollar for a 30 year old runningback, no matter who he is and what he has sacrificed for the team. This isn’t baseball. The NFL has a salary cap. Moving forward, will Jacobs be the strong back he was from 2007-2010, or will he be more like last year’s version? Did he have a bad year, or has he entered the 30 year decline? Personally, as much as I have enjoyed the Brandon Jacobs era, I would not take this risk. Sure, Jacobs might have a year or two left in him, but I get the feeling he’s going to ask for more than that in his next contract (at least in guaranteed money). It might be best to let him find that payday somewhere else, unless he wants to be a team guy again and accept a lower salary. Something tells me that two Super Bowl Championships might be enough for Brandon, and it might be time to be selfish. After all, how many more chances to cash in is he going to have? We’ll miss you Jake, hope to see you again some day. so he does complain a lot, mostly if he doesn’t get enough carries, even if he’s not doing well. he doesn’t so much complain about his current contract as he does about his future one (i neeed to get carries to show what i can do and earn more money). not the worst kind of complaint, but it does wear on you after about 5 years. my take, they can replace what he does. maybe not with someone as big or as fast, but certainly with someone who will match his actual stats.